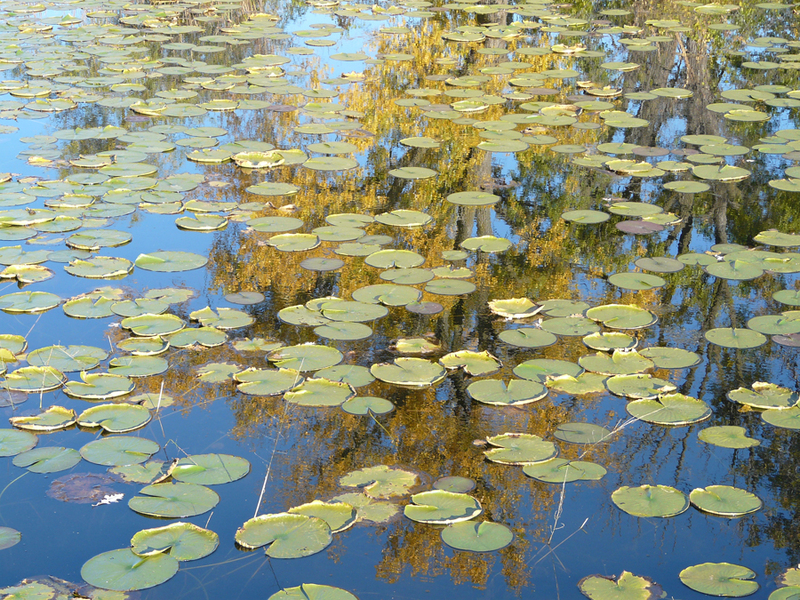 Download the Wetlands Activity. Answer the questions using the text below. Click here for the PDF. The “hotdog” or “cat’s tail” is the seed head of a cattail. 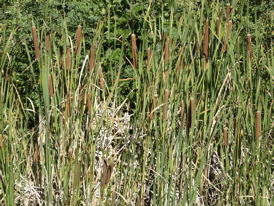 Cattails are an important plant that is used by many animals in the wetlands. 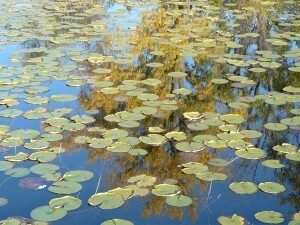 The long leaves and roots are eaten by muskrat, ducks and geese. Long ago, Native Americans used the cattail plant as a virtual “supermarket”. The leaves were used for weaving. They ate the young shoots of the cattail, which taste like cucumbers. They also cooked and ate the roots. Purple loosetrife is a beautiful plant that was introduced from Europe and is now invading the wetlands. 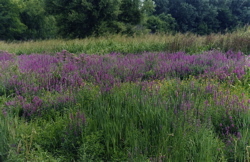 Over the years, loosestrife has replaced native plants, like cattails, that are important for wildlife. Unfortunately, very few animals eat purple loosestrife because the roots are too tough for animals to chew and the seeds are too small to eat. However, in the 1990’s, scientists released a type of beetle that only eats purple loosestrife, and purple loosetrife has been reduced significantly in our wetlands. Willow trees grow along the edge of the wetlands. Their roots like to be wet. Many birds and mammals use willows as nesting areas. 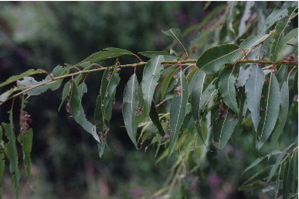 Many insects eat willow leaves. Native Americans used willow for weaving. The leaves were chewed and used for headaches. Cottonwoods are the largest trees in Minnesota. Cottonwoods can survive spring flooding even if their trunks are entirely surrounded by water. Their leaves make a beautiful whispering sound when the wind is blowing. Outer branches that are found on the ground, will have a star pattern inside them if they are cut at the correct location. The muskrat’s favorite plant is cattail. They eat cattails and they make their huts out of cattails. Muskrats also eat other types of plants that are found under the water. 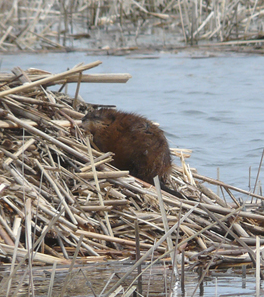 Several muskrats may live in a hut during the winter. They will use the hut for shelter and food, eating the cattails that form the hut. Muskrat populations will increase over several years. At some point the population will peak and then crash, making it difficult to find any muskrats at all. 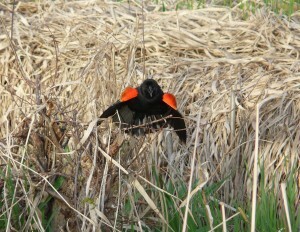 Red-wing blackbird in cattail marsh. When many people think of a wetland, the image they see is a red-wing blackbird singing on a cattail stalk. In spring, the “ookalee” song of the red-wing has been called the “voice of the marsh”. 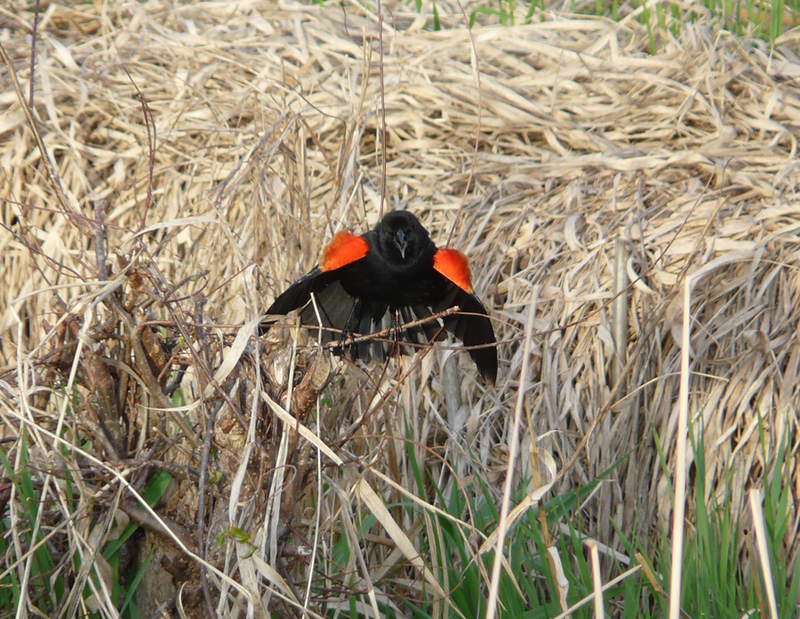 In the spring, males display their red wing patches as they establish territories in the cattails. Red-wings build a nest that is woven around the cattail stalks. The red-wing feeds on wetland weed seeds and insects. Raccoon tracks in the mud. Raccoons live in the forest, but one of their favorite places to feed is at the wetlands. In the evening, they feed on crayfish, frogs, turtles, and some fish. Raccoons use their very sensitive front paws to locate their prey. Since raccoons hunt a night, it is unusual to see one. 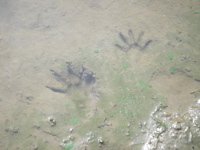 However, raccoon tracks are commonly found in the mud along the water’s edge. Leopard frog resting on the shoreline. The dominant night sound in the spring is the calling of the frogs. 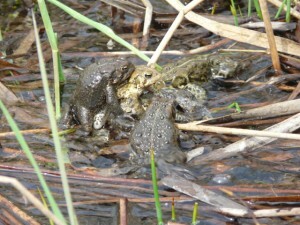 Male frogs call to attract females to the pond. 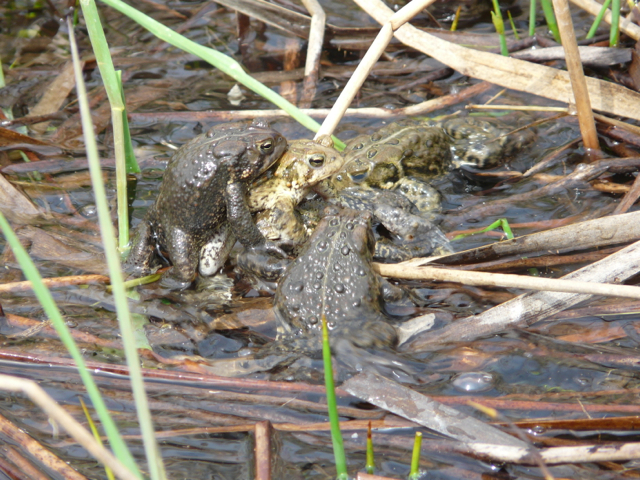 Each type of frog has its own special call: The American toad makes a beautiful “trilling” call in May; the leopard frog makes a “snoring” call in mid-April.After they mate, the eggs are laid and the tadpoles develop through the spring and early summer.During this time, the tadpoles are food for fish, herons, garter snakes, raccoons, and pond creatures. In the summer most adult frogs leave the pond to hunt for insects. The leopard frog feeds on insects at the edge of the wetlands during the summer. Salamanders are often overlooked in the wetlands. They quietly exist under logs in woodland areas and in the spring travel to ponds to mate and lay eggs. The larva are found in temporary ponds and metamorphose into adults in late summer. 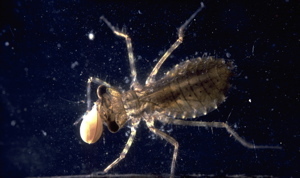 The eggs and larva are eaten by various pond critters including dragonfly nymphs, giant water bugs and water tigers. 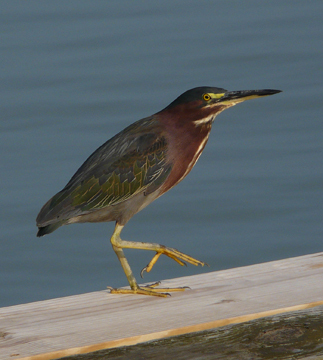 Raccoons, herons and mink also feed on the larva. 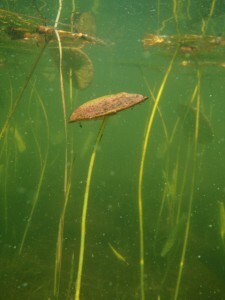 Underwater view of an emerging water lily leaf. 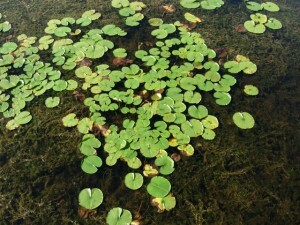 Water lotus with leaf growing above the water. Water lily with the pad on the water’s surface. lotus is out of the water. 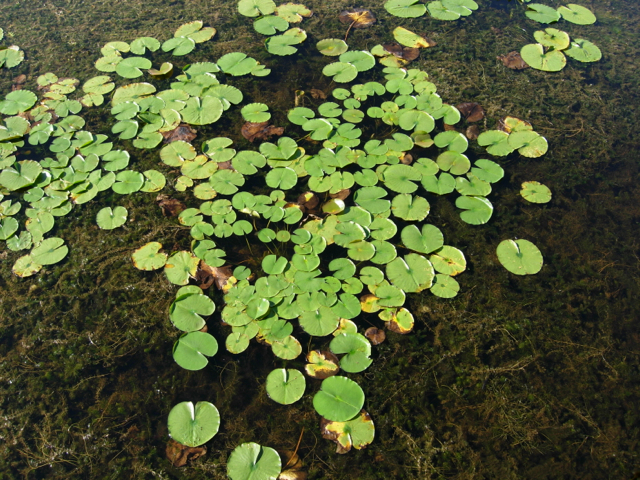 In late spring, the water lily roots send up a long stem with the lily pad (or leaf) attached to it. Muskrats, beaver, and geese eat the roots of both of these plants. 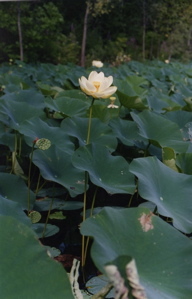 Many animals use both lotus and lilies as safe resting places and will lay their eggs on them. 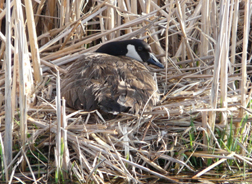 There are four different types of waterfowl that nest in our local wetlands. The most common are the Canada goose and the mallard duck. 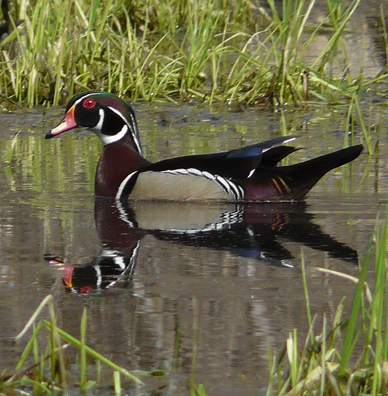 The wood duck and the blue-wing teal also nest in our area. These birds feed on submerged plants (plants living beneath the water) and small creatures called zooplankton. 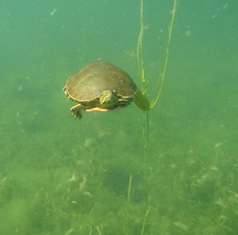 Turtles are an important part of the wetlands community. Turtles spend the winter hibernating in the mud at the bottom of a pond. They are able to extract enough oxygen from the water to survive underwater in the winter. Turtles eat underwater plants, detritus ( dead things on the bottom of the ponds), and insect larva that live in the water. 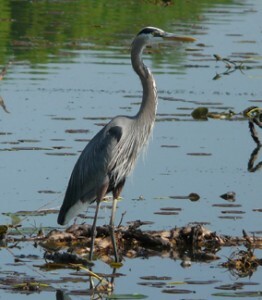 Herons are fishing birds that live in the wetlands. They are magnificent birds and can be over four feet tall. Herons are “waders”. They have long stick-like legs which allow them to wade into the water and approach their prey. They use their spear-like beak to grab fish and frogs. 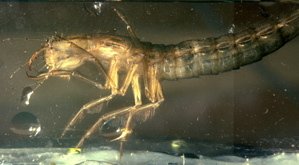 Nymphs are the larvae of dragonfly- type insects. The nymphs live in the water for up to a year and they are adults for a few months in summer.The nymphs are predators feeding on a variety of pond creatures. The dragonfly nymph on the left is eating a clam. Nymphs are an important food source for fish, turtles, and other animals. Water tiger with pinching jaws. The water tiger is one of the most powerful insect predators in the water. They have pinching jaws for grasping prey. Water tigers feed on small fish, tadpoles, nymphs, and other water insects. The water tiger is the larva of a diving beetle. The osprey feeds in the open water of a wetland. It is also known as the “fish hawk” because of its ability to dive from the sky, with its talons extended and grab a fish from the water. A hundred years ago, osprey were senselessly killed for “sport” around Twin Cities lakes and were extirpated (totally killed off) from the area. In the 1980’s dedicated scientists set about re-introducing the osprey to Twin Cities lakes. 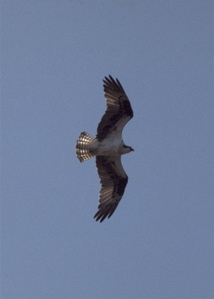 Today the osprey is a common sight around local lakes. The pumpkinseed and bluegill are two types of sunfish. The bluegill is the most common panfish in Minnesota. The bluegill gets its name from the blue coloring at the tip of its gill flap. 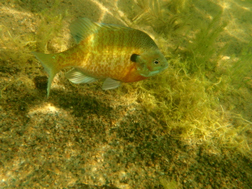 The pumpkinseed is similar to a bluegill except it has a bright orange spot at the tip of its gill flap. They feed on various types of minnows, aquatic insects, snails, and weeds. 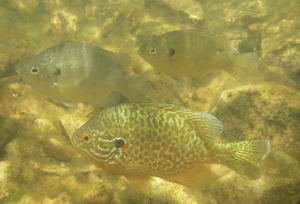 Pumpkinseed and bluegill spawn (lay eggs) in May and June. Spawning occurs in colonies. Males choose shallow bays with sandy bottoms for their nests. A male will clear a depression in the bottom for a nest (two feet across) and wait for a female to enter the spawning area. A female bluegill will lay up to 60,000 eggs. After the fertilized eggs are laid, the male chases the female away, guards the eggs. After the eggs hatch he even guards the young. 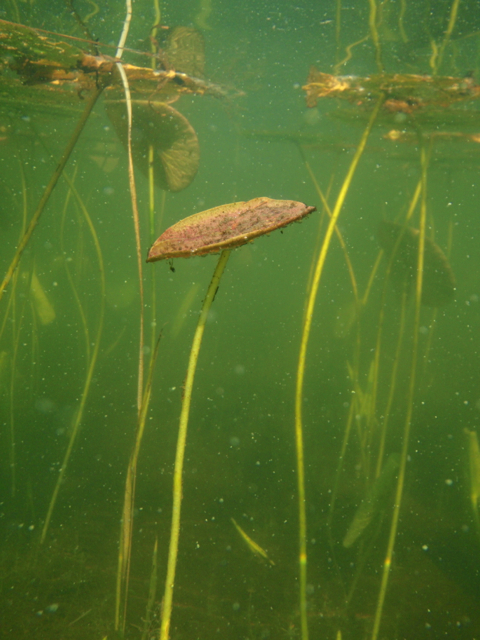 Often the best places to find pumpkinseed and bluegill is at the edge of a submerged weed bed. An average bluegill weighs from eight ounces to two pounds. The Minnesota state record for a bluegill is two pounds 13 ounces. Fisherman know that the northern pike is a tremendous fighter. Pound for pound it must rank near the top of the list for freshwater game fish. 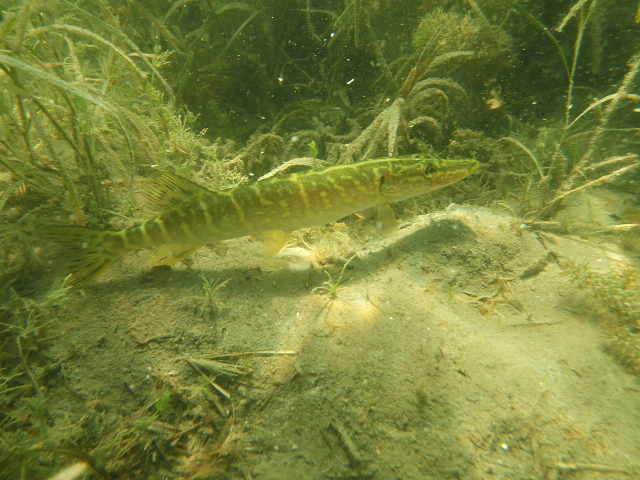 Pike have a long streamlined body that is specialized for short bursts of speed to capture prey. It is well camouflaged with its bluish green coloration. Pike may reach a very large size of 25-30 pounds. The Minnesota state record for northern pike is 45 pounds, 12 ounces. Pike grow 10-12 inches in their first year. A 36 inch specimen may be 9 years old.Pike are usually found in the shallow weedy water. However, in August, when the water is warmer they move into deeper cooler waters. 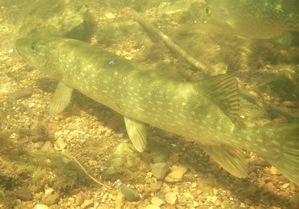 The northern pike is primarily a sight feeder. It waits for its prey in the weed bed and then darts out with lightning speed and seizes its prey. They feed on minnows, sunfish, perch, and suckers. Pike will even catch small muskrats and ducklings.